Did you know that potatoes contain a healthy dose of Vitamin C? No, nor did I. When I think of great sources for Vitamin C my list generally begins and ends with citrus – oranges, lemons, limes, grapefruit. However, it turns out there are lots of fruits and vegetables that rank higher on the Vitamin C scale than your average orange. These include, bell peppers, broccoli, cauliflower, Brussels sprouts, dark greens (kale, spinach, etc), kiwi fruit, strawberries, and pineapple. Apparently oranges just have a really good PR campaign. Given how much of all of these foods I eat during the winter it’s a miracle a cold ever manages to penetrate my Vitamin C shield, but somehow I managed to succumb to the common cold twice in under two months. Yet another reason that I want to break up with winter (Dear Winter – It’s not me; It’s you). Potatoes are also – apparently – not only a good source of Vitamin C (not at the top of the pyramid, but not one of the grunts at the bottom either), they’re also a good source of potassium and Vitamin B6 (which is apparently very important to the efficient functioning of your metabolism). In addition they are a complex carbohydrate, and generally speaking significantly more nutritious than their current reputation as an empty carbohydrate would suggest. Why is this relevant? Well, one of the reasons the 19th C potato blight in Ireland was so devastating was because the Irish diet had become so entirely dependent on the potato as a source of nutrition over the course of the late 18th/early 19th centuries due to a variety of economic and social policies. When the blight struck in 1845, and then struck again 1846 destroying up to 75% of the Irish potato crop nation-wide, it was catastrophic not simply because it destroyed a source of revenue, but also because it eradicated the main food source for most of the population. This was exacerbated by the response from the British Crown. Once they decided that doing nothing and waiting it out apparently wasn’t a viable option they opted to repeal the Corn Laws on the theory that the Irish could replace potatoes with bread made from cheap grain from England. Unfortunately, bread is less nutritious than potatoes, and also nobody could afford to buy the grain to make the bread in the first place. In a neat instance of irony, repealing the Corn Laws not only didn’t particularly help the Irish, it also made Robert Peele’s government deeply unpopular in England and got him thrown out of power. The next solution that was dreamed up was to buy corn from the Americas (because it was cheap) and sell that to the Irish. This was problematic for a number of reasons. Firstly, the Irish were still impoverished and mostly couldn’t afford to buy the corn any more than they could afford to buy the English wheat. Additionally, corn requires more processing than wheat and Ireland didn’t have the mill capacity to grind enough corn to feed the population. And finally, corn is harder to digest than potatoes so the few people who could afford to buy the corn still weren’t getting enough nutrition from it. Why yes, it is possible I just listened to a podcast on the Irish Famine/Potato Blight. Why do you ask? All this being true, I crave potatoes for their starchy comfort and not their nutritional qualities, although I suppose it’s nice to know that they have some. This has a been a winter in which any kind of comfort should be seized and exploited to the fullest extent of the law. In honor of St. Patrick’s Day I went Irish with my comfort food this (last) week. 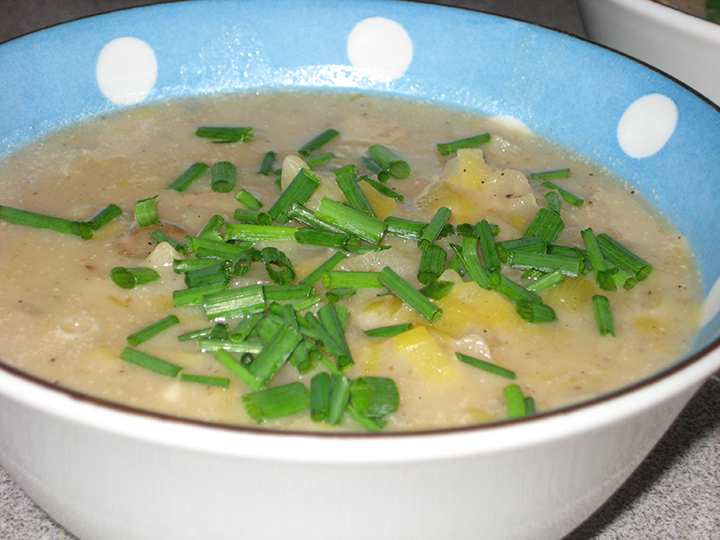 Colcannon is one of those national dishes that make virtue out of necessity. Much like the Swiss turning stale bread and leftover cheese into a delicacy (if fondu can ever be described as delicate), the Irish turned potatoes and cabbage into something worth celebrating by seasoning it liberally with butter and cream. If you don’t think that butter and cream can be called seasonings, you’re not using enough butter and cream. This riffs on the traditional dish of mashed potatoes and cabbage (or kale) by turning it into a hearty creamy soup which you then don’t have to feel guilty about serving with slabs of freshly baked soda bread slathered in butter (I’m not quite Dutch enough to justify putting mashed potatoes on bread). Melt the butter in a large heavy pot. Sauté the onion, leeks, and cabbage until tender – about 10 minutes. Add the garlic and cook for 1 minute. Sprinkle the flour over the vegetables and stir to coat. Add the white wine, scraping up any browned bits on the bottom of the pan, and cook until the mixture thickens slightly (1-2 minutes). Add the chicken stock and potatoes and bring to a boil. Reduce to a simmer and cook until the potatoes are tender, about 15-20 minutes. Smash some of the potatoes against the side of the pot (or use a potato masher very gently) to thicken the soup. Stir in the heavy cream, and season the soup to taste with salt and pepper. As a warning, this soup will take a lot of salt – don’t be alarmed. 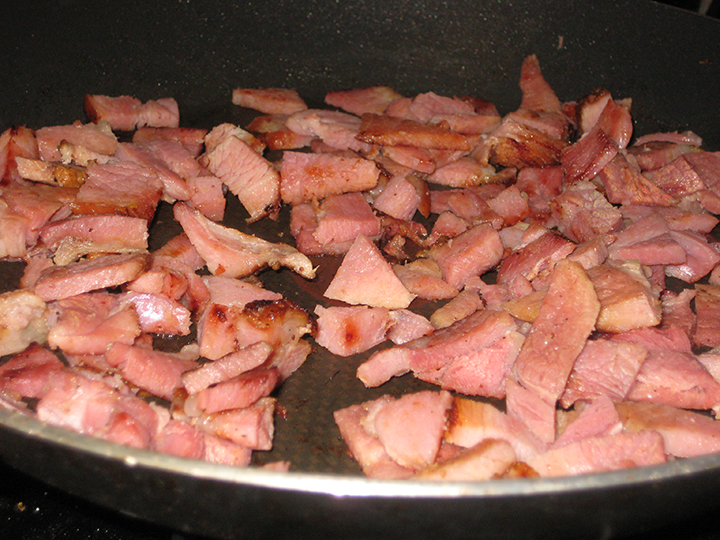 Sauté the diced ham in a small skillet until a little browned and warmed through. Divide the ham evenly between the (empty) soup bowls, and then ladle soup over the ham. Garnish with the chives. I doubled the recipe and sautéed my onion-leek-cabbage in batches to make sure that everything actually sautéed rather than just steaming – i.e. I melted a 1/3 of the butter & sautéed my onions, removed them from the pan; melted another 1/3 of the butter and sautéed my leeks, added them to the bowl of onions; melted the last of the butter and sautéed the cabbage, returned everything to the pan and proceeded with the recipe as above. I doubled the recipe and made one plain loaf, and one loaf with raisins & cinnamon. I suppose if you really wanted to you could add caraway seeds to your loaf, but I’ve never understood why people ruin perfectly good soda bread by doing this (no matter how traditional it is). Sift together the dry ingredients. If you like raisins in your soda bread, add them and the cinnamon now. Melt the butter. Whisk 2 Tbsp of the butter into the buttermilk until the butter forms clumps. Stir the buttermilk-butter mixture into the dry ingredients until a dough just forms – use a light hand. Turn out on to a floured surface and bring dough together into a 7” ball. Transfer to a parchment lined baking sheet. Slash the top of the dough ball with an X with a serrated knife (cuts should be about ¼” deep). Bake for 40-50 minutes, or until a toothpick comes out clean. (re)Melt the remaining 1 Tbsp butter, and brush all over the top of the bread as soon as it comes out of the oven. Allow to sit for at least 15 minutes before slicing. The bread is best the day you make it, still slightly warm from the oven. However, it also toasts up nicely the next day. I’d love to claim that the kale salad was also an homage to colcannon which traditionally can be made with either cabbage or kale. But, honestly? 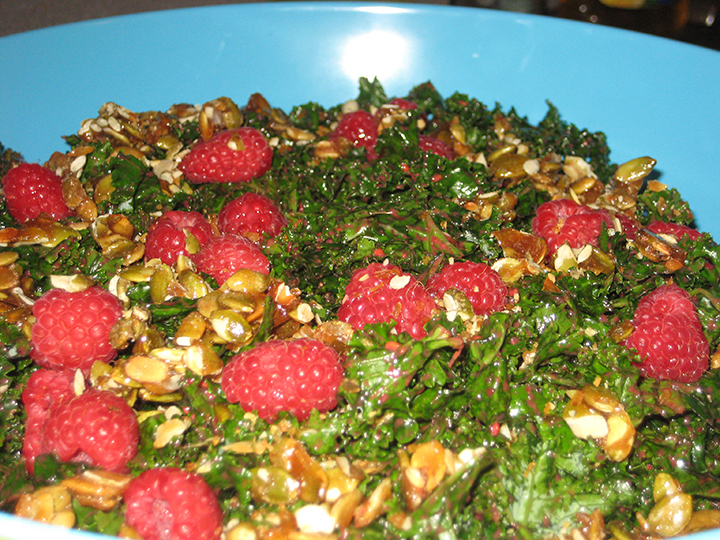 Mostly I just had a lot of kale in my fridge that needed to be used, and I had leftover raspberry vinaigrette and candied pepitas from the Oscars.